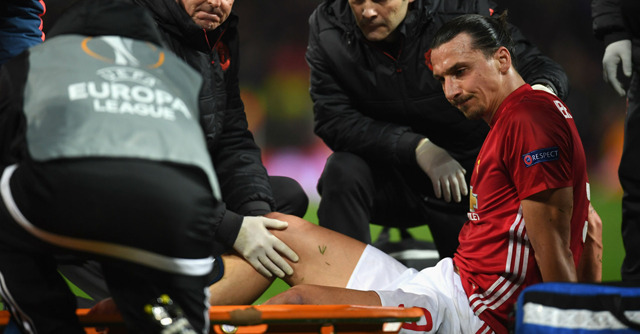 Zlatan jumped and landed horribly on his knee during Manchester United's Europa League-quarterfinal against Anderlecht on Thursday. It happened just before the 90 minutes were played and he was taken off. No update about how serious the injury is has been published by Manchester United but the initial reports indicated it could be a serious injury. "I want to wait but my feeling is not good, for both. I want to try to be optimistic but I’m not. I don’t think they are easy injuries but I prefer to wait until all the tests are done tomorrow. After tomorrow then I can speak what I feel because I am a manager, not a doctor", José Mourinho said after the game. Manchester United went on to win the game after Marcus Rashford scored the winning goal in extra time. Read Manchester United's game report here.